This is MY favorite retreat location. There is something about this small corner of the world that opens hearts and rejuvenates spirits. The common phrase "Pura Vida" or Pure Life is not only found in the lifestyle, but the in land and the food as well. Our retreat is held at the Ripjack Inn, which is located in the Las Baulas National Park. 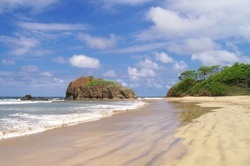 The park was designed to protect the endangered Leather Back Sea Turtle who still nest on Playa Grande Beach. If you walk the beach at sunrise there is a good chance that you will see the baby turtles on there long journey to the sea. There is so much to do and explore in this area of Costa Rica. Here are just a few activities (other than yoga) our retreat guests have participated in over the last few years. Nothing. Sit on the beach or read a book by the pool. ​I am happy to help you plan your perfect retreat!